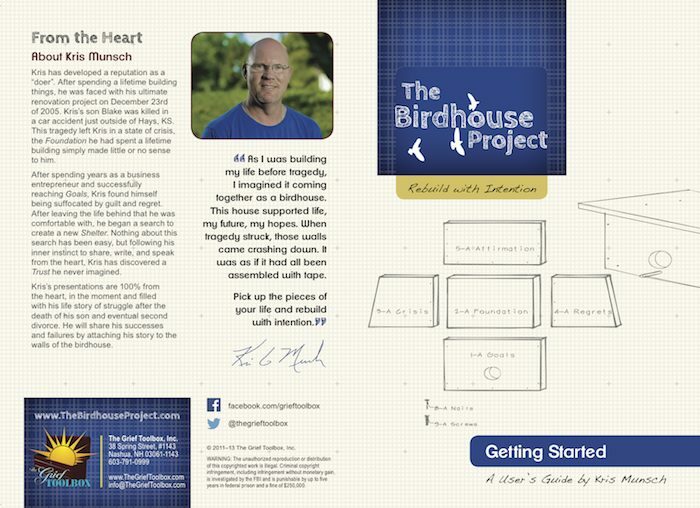 The Birdhouse Project is the first project-based healing tool of its kind. It was built around the belief that growth is most evident when people experience, reflect on that experience, and act in more beneficial ways because of their examined experience. The Birdhouse Project is a reflective, tangible tool of self-discovery that can be used to identify the areas of life, grief or crisis that are not working for you. These realizations will help you make sense of the difficult circumstances surrounding your experience and help you find a direction for moving forward. This version allows a facilitator to utilize a DVD to take groups through the project step by step. A guide will assist the facilitator with the simple step by step instructions, guiding participants in a group setting. This kit also includes ten (10) cardboard birdhouse kits for participants.